scaled agility over the whole enterprise. Learn from the inventors of the unique Applied SAFe® solution with hands-on experience in SAFe® concepts and adoptions the key practices and its application to successfully lead your lean-agile change initiative. Specific topics like portfolio or product management, requirements engineering, and emergent design in the SAFe® context complement our training curriculum. Learn how to get started, enhance and use Applied SAFe® as an extendable, customizable and comprehensive implementation of SAFe® as a process model. The contained courses are built to help you understand how to use the solution the best way, how to instantiate, tailor and adopt Applied SAFe® to your needs and how to achieve regulatory compliance. Specific topics around lean-agile development are our passion. Areas like Governance, Compliance, Human Resources, Portfolio Management, Architecture, Product Development and many more will be covered step-by-step. Do not hesitate do get in touch in case you have an additional topic you would like to see in our training curriculum. Benefit from our mature development experience with process engineering on the Stages platform. We gained in-depth skills not only on process design but also in the effective use of the tailoring features, different instantiation and deployment mechanisms as well as compliance mappings to a number of reference models and much more. Get inspired! Develop a skillset that’s in demand worldwide—and empower your enterprise to succeed in a disruptive marketplace—when you become a SAFe 4 Agilist (SA). During this two-day course, you’ll learn the principles and practices of the Scaled Agile Framework® (SAFe), how to execute and release value through Agile Release Trains, and what it means to lead a Lean-Agile transformation at enterprise scale. You will gain an understanding of the Lean-Agile mindset and why it’s so effective in today’s adapt-or-die marketplace. You’ll also get practical advice on supporting Agile teams and programs, empowering a Lean Portfolio, building a continuous delivery pipeline and DevOps culture, and coordinating large solutions. Build your skills as a high-performing team member of an Agile Release Train (ART)—and learn how to collaborate effectively with other teams—when you become a SAFe® 4 Practitioner (SP). During this two-day course, you will gain an in-depth understanding of the ART, how it delivers value, and what you can do to effectively perform your role using Scrum, Kanban, and XP. You will also learn how to write stories and break down features, plan and execute iterations, and plan Program Increments. Finally, you’ll learn about the continuous delivery pipeline and DevOps culture, how to effectively integrate with other teams in the program, and what it takes to continuously improve the train. This two-day course provides a comprehensive overview for understanding the DevOps competencies needed to accelerate time-to-market by improving the flow of value through the Continuous Delivery Pipeline. Attendees will map the current value stream through their delivery pipeline from idea to cash, and identify practices that will eliminate bottlenecks to flow. The course will build an understanding of the complete flow of value from Continuous Exploration to Continuous Integration, Continuous Deployment, and Release on Demand. Attendees will explore SAFe’s CALMR (Culture, Automation, Lean, Measure, Recover) approach to DevOps, which helps create a culture of shared responsibility for the full spectrum of Solution delivery. It helps align people, processes, and technology throughout the organization to achieve faster time-to-market. Attendees will leave with the tools they need to execute an implementation plan for improving their delivery pipeline, and the knowledge they need to support the plan. 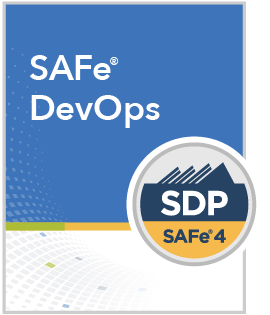 The course also prepares students for the optional SAFe® 4 DevOps Practitioner (SDP) certification exam. During this two-day course, you will learn the principles and practices of the Scaled Agile Framework® (SAFe®), how to execute and release value through Agile Release Trains, and what it means to lead a Lean-Agile transformation of a program inside a government agency. You will gain an understanding of the Lean-Agile mindset and why it’s an essential foundation for transformation. You will get practical advice on building high performing, multi-vendor Agile teams and programs, managing technology investments in Lean flow, acquiring solutions with Agile contracting, launching the program, and planning and delivering value using SAFe. You will also learn how specific leadership behaviors can drive successful organizational change, even in government. The course also prepares students for the optional SAFe® Government Practitioner certification exam. This training and coaching package is intended for those enterprises or organizations who want to launch their first Agile Release Train (ART). It includes the minimal elements to train to involved stakeholders and prepare sufficiently for the first PI planning session, launch the ART and improve the PI. In this two-day workshop, attendees will gain the tools and techniques necessary to organize around value for optimal business results, implement Lean-Agile Program Portfolio Management, Governance and Budgeting. You will also learn how to use and implement the Portfolio Kanban system to accelerate value flow to the programs. Attendees will leave with a set of SAFe practices that accelerate Value Flow and support Lean-Agile Program Portfolio Management, Lean-Agile Budgeting and Software Capitalization, and Agile Lifecycle Governance. The Value Stream Workshop provides a structured approach for collaborating with stakeholders to design ARTs around the flow of value in the enterprise. Unlike many ad hoc approaches, The Value Stream Workshop provides a proven, systematic approach to optimize design by considering the dependencies, coordination, and constraints. This training and coaching bundle is intended for those enterprises who want to start their agile journey on portfolio level. It includes the minimal elements to train involved leaders and stakeholders to organize around value for optimal business results with lean-agile PPM and to design ARTs around flow of value in the enterprise. This one-day course provides a practical opportunity to see Applied SAFe in action as an executable process implementation of the Scaled Agile Framework (SAFe). You will learn how to disaggregate SAFe into process elements, how to customize Applied SAFe on each framework level for specific needs of different endeavors, understand the benefit of executable Applied SAFe instances for an organization and how to reach compliance to reference frameworks like ISO standards or SPICE. This is the foundation that will support the growth of your processes for building complex cyber-physical systems – from teams to enterprise – simple to complex. In this 2-days-course you will gain the knowledge needed to lead the integration, adoption and extension of Applied SAFe within your company. You will learn how to structure your workspace hierarchy, your process model and types to be able to define different implementation strategies as supported by Applied SAFe. You learn how to integrate and use different reference models and the main reporting features of Applied SAFe to achieve regulatory compliance. This training is further extended with knowledge about adoption preparation of Applied SAFe® for the company on a Team-, Program- and Portfolio-Level. This 3-days-course teaches the key concepts for effective process engineering with Applied SAFe on the Stages platform. You will learn how to integrate, adjust and extend Applied SAFe based on concepts like workspace hierarchies, effective use of process types for a number of deployment strategies, inheritance mechanisms for process elements, branching and merging with overlays, manual and automated tailoring and process model extensions with your existing and new process assets. Understand design principles like work product and process modelling and learn how to define and apply process templates to ensure a consistent design. Understand the mechanisms for effective bindings to reference models like Automotive SPICE, CMMI or any other ISO, IEC or DIN standard. In this 2 days course you will gain the knowledge needed to deeply understand the mechanics of metrics in Applied SAFe®, how the metric model can be altered, extended and integrated with the existing tool landscape. This is a complementary course to ‘Applied SAFe® Engineering’ and usually does not make sense taking without the knowledge of an Applied SAFe® Process Engineer. In this 2-days course you learn how to deploy Applied SAFe® in your company by using effective deployment strategies and process distribution concepts like Tailoring, Process Instantiation, Permissions, User Administration, Metrics, etc. as supported by the Stages platform. Understand the already existing over 180 tailoring options to be able to customize each Applied SAFe level to the needs of its users. Understand the relevant customizations and key concepts of Applied SAFe to prepare a change and deployment plan that achieves high community acceptance and adoption success. In this half day course you will gain the knowledge needed to use Applied SAFe® for your daily work in the context of the Scaled Agile Framework and the underlying tool Stages from Method Park. Depending on your role you learn the main Applied SAFe elements in the context of the respective SAFe level including provided templates. Optionally, if configured for your organization, you will be trained in the use of the integrated work product and state management feature. This two-day workshop will discuss concepts, risks and possible solutions on how to organize, design, process and manage process engineering in an agile environment. As it is stated in the agile manifesto: ‘individuals and interactions over processes and tools.’; in large scale companies building the most important systems, people, knowledge and auditable processes are usually a given and a prerequisite to even stay in business. This two-day workshop will discuss concepts, risks and possible solutions on how to reach compliance and still use the benefits of scaled agile systems development as propagated by the Scaled Agile Framework (SAFe). You will learn how to systematically reach compliance on a given internal or external reference model and how to use existing process assets (like SOP’s) to achieve lean-agile compliance to reference frameworks like ISO standards or SPICE Assessments in your company. This is the foundation that will support the growth of your processes for building complex cyber-physical systems – from teams to enterprise – simple to complex. This training and coaching package is intended for those enterprises or organizations in high assurance system and software development who want to leverage lean-agile practices while still reaching compliance on given internal or external reference models (e.g. Automotive SPICE, CMMI, IEC 62304). Scaled Agility and its practices for such complex cyber-physical systems is trained on Applied SAFe®, the unique implementation of the Scaled Agile Framework (SAFe®) as an executable process model. This one day workshop addresses various aspects of modern people solutions and provides guidance on how to align HR with the demands and realities of a SAFe lean-agile organization to bring people operations into the 21st century with lean-agile values and principles. Gain insights from modern scientific findings, best practices and trends in organizational excellence and develop a toolbox of solutions, best practices, insights and ideas. Benefit from the experience and mindset of others through team exercises, integrated case study, hands-on activities and open space sessions. Where are your processes? In your head, in files on a shelf, in Word, PowerPoint, or in Stages? In this workshop, learn why evolutionary development of your processes towards a methodical approach of process management is necessary to cope with challenges of increasing complexity and how we support you with the Stages Method. This workshop consists of presentations, exercises and discussions and offers the opportunity to ask questions and exchange experiences. All participants receive detailed training documents and guidelines which support their daily work life. This 2-days-course teaches the key concepts for effective process engineering on the Stages platform. You will learn how to design and engineer processes based on concepts like workspace hierarchies, effective use of process types for a number of deployment strategies, inheritance mechanisms, branching and merging with overlays, manual and automated tailoring and process model extensions with your existing and new process assets. Understand design principles like work product and process modelling and learn how to define and apply process templates to ensure a consistent design. Understand the mechanisms for effective bindings to reference models like Automotive SPICE, CMMI or any other ISO, IEC or DIN standard.